Stay Cool and Fish On! Above average fishing continues, even as water temperatures climb into the mid- to high-80s. Getting out early during the cool hours of the morning becomes paramount to a successful outing. The late afternoon bite has been decent and generally gets even better as night falls. Night fishing is especially good this time of year around docks and bridges where lights give predator species a great place from which to ambush unsuspecting prey. The shallow grass flats have been very productive early and have given up scores of healthy slot-sized speckled trout. 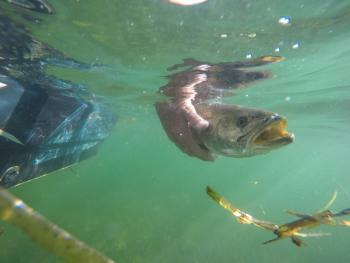 Topwater lures are fun to throw and can be very effective at catching a lot of fish, but it’s the D.O.A. shrimp or a jig and soft plastic bait combo that do the bulk of the dirty work. Even if they get the same number of strikes, the hook ratio for soft plastics is significantly higher. Personally, I like the “thump” that you feel when fishing jigs on braided line just as much as I like watching them chase it. Redfish have been widely spread throughout the bays and along the beaches. There are a hundred different ways you can go after them and, aside from their brute strength, I think that’s part of their appeal to most anglers. The backwaters offer opportunities to see fish tailing or waking along shallow reed shorelines, in or around small creeks and near run offs. In the bay closer to the pass, you can find schools of redfish hanging out in deeper water off of big points and steep drop offs. You can even spot large schools cruising along the beach. At night, you can find big bull reds laid up underneath bridge lights on outgoing tides feasting on blue crabs, shrimp, and eels. Mangrove snappers have also shown up in large numbers around docks, seawalls and deep sandy areas that feature some sort of structure for them to hang around. You can usually find mangroves by cruising slowly around structures and simply looking for them. If the structure is vertical, the mangroves will usually be somewhere near the surface. The best baits to generate a lot of bites are live shrimp, small scaled sardines, threadfins, or menhaden. To get the bigger ones to chew, I like to throw baits that are a little heartier, like pinfish or small mullet. I fish them on a #2 circle hook, either free-lined or with a small split shot.